421 pp. Cloth cover with color applied pictorial, color frontispiece, black and white illustrations by Worth Brehm. The classic story by Mark Twain. A nineteenth-century boy from a Mississippi River town recounts his adventures as he travels down the river with a runaway slave, encountering a family involved in a feud, two scoundrels pretending to be royalty, and Tom Sawyer's aunt who mistakes him for Tom. 302 pp. Cloth cover with applied printed paper title, frontispiece, heavily illustrated and decorated by Louis Rhead. 285 pp. Cloth cover with stamped frame around applied color illustration, frontispiece, 7 color plates. Illustrated by Franklin Booth. The story of two boys who look identical but live very different lives. One, Tom Canty, an abused pauper and the other, Prince Edward, son of King Henry VI. The Wax-Figger Show of Mrs Jarley, containing many new figures, carefully arranged, with full instructions for presentation, costumes, etc. 39 pp, soft cover play. Inspired by the the character, Mrs Jarley, and her show described in Charles Dickens book 'The Old Curiosity Shop'. The character of Mrs Jarley was actually inspired by real life wax sculptor, Madame Tussaud. This play depicts overs 50 'wax' figures, ranging from Cleopatra to a train robber and from a vampire to Little Bo-Peep. Each character has a little speech describing themselves. There is an annotation on Mrs. Jarley's opening speech were a few sentences are penciled in. Measures 7 1/2" x 4 3/4"
844pp. Green cloth board, stamped in red and black with gilt accents. Volume 3 starts at November 2, 1886 with No. 366 and ends with No. 417 on October 25, 1887. 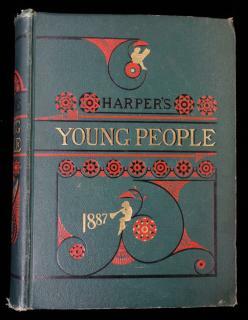 Harper's Young People was a weekly magazine: each issue was 16 pages, and contained fiction and nonfiction stories, poems, and puzzles, profusely illustrated. Some stories were published in the style of a serial and released chapter by chapter. 11 1/2" x 8 1/2"..